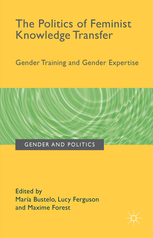 This edited volume is part of the Gender and Politics series, which aims to showcase ‘cutting-edge research … [and] topical and innovative approaches to gender politics from new authors and wellknown academics as well as practitioners working on related issues’. Previous titles have addressed issues including LGBT activism and the making of Europe, institutionalising intersectionality and the Europeanisation of policies on gender equality. Two of the editors, María Bustelo and Lucy Ferguson, are at the Universidad Complutense de Madrid, and Maxime Forest is at Sciences Po Paris, where he is scientific supervisor of the European Union-funded Effective Gender Equality in Research and the Academia (EGERA) project. The book is divided into two sections. Part I comprises four chapters on ‘key issues in feminist knowledge transfer’ and Part II presents three chapters offering ‘critical case studies of feminist knowledge transfer’. The editors provide a comprehensive introduction (preceded by a foreword and a preface – the book takes 28 pages to warm up) and a concluding essay. The volume is situated broadly within long-standing international mandates to mainstream gender equality in policy-making, and the concomitant need to train often sceptical, frequently unwilling, and sometimes fundamentally hostile policymakers in order to familiarise them with the issues to take into account, illustrate how to do so, and suggest ways in which to monitor policy outcomes – intended and unintended. Among many other difficulties, as Myra Marx Ferree and Mieke Verloo note in their foreword, ‘“gender” is often thinned out into meaning only women’, leading to the assumption that it is basically up to women to do all the running on achieving gender equality. Emanuela Lombardo and Lut Mergaert describe various forms of resistance to gender training – ‘trivialising gender equality’, regarding it as ‘out of fashion’ (thanks to post-feminist perceptions that if formal equality has been achieved then everything has been done and dusted), or individual men claiming the gender-equality high ground on the grounds that they contribute to some household chores (p. 50) – as if this erased the fact that on average even mothers in full-time paid work still perform some 80 per cent of household chores. In a society that regards ‘choice’ as essentially individual, the absence of women in positions of power and the gender pay gap can readily be attributed to women’s ‘choice’ to put their family first at the expense of dropping out of the labour market or not entering politics. The need for change is implicitly denied, but, more insidiously, gender issues can be thus dismissed as being based on out-dated feminist ideology rather than on hard, rational, scientific knowledge. Women and men who benefit from the status quo – or, more to the point, can be persuaded that they do – will have little interest in challenging it. At the same time, ‘the use of gender training and gender expertise as instruments of power’ (p. 14) can imply that trainees’ existing knowledge and understanding of gender relations are defective rather than being legitimately rooted in their own worldviews and experiences. Way back in 1968, Paulo Freire, the Brazilian popular education worker, debunked the ‘banking’ approach to learning as a means to achieve changes in beliefs and consequently in behaviour, and yet this top-down approach to training that aims to promote attitudinal and political change persists. Standardised gender training workshops, attendance of which may even be compulsory (as it was for managers in some major NGOs, certainly in the 1990s) – paradoxically, in order to achieve ‘gender mainstreaming’ – inevitably treats gender relations in terms of ‘frameworks and checklists that can be easily applied, and … push for the condensation of complex theories and context-specific analysis into easy and digestible terms’ (Tine Davids and Anouka van Eerdewijk, p. 87). Despite the fact that the institution had long had ‘a teaching and research programme for mainstreaming gender knowledge’ (p. 154), not only were some stakeholders ignorant (and disbelieving) of ‘the gender pay gap highlighted in Science Po’s latest Gender Equality Report’, but ‘the scholarly capital in gender studies can be underestimated – or even denied – by stakeholders who refute the very existence of gender inequality, or who underestimate certain key issues (ibid.). The editors draw four principal conclusions. First, the importance of exchange between ‘insiders’ and ‘outsiders’, which extends to engagement between different versions of feminist knowledge and practice, North and South, and should raise greater self-awareness of where gender trainers are themselves situated, and how this affects their vision and views. Second is the need to re-politicise feminist knowledge transfer, in the context of resource constraints that, ultimately, are a reflection of where power lies. Third, the call for greater attention to intersectionality to ‘be addressed through engagements with hierarchies and stratified knowledges, which can be brought out in training and expertise contexts’ (p. 173). And fourth is an argument for a ‘“bottom-up process of professional ethics” for gender experts and gender trainers’ (ibid.). As is the case of most edited volumes, which generally tend to be read selectively rather than cover to cover, while each chapter is freestanding, there are also overlaps and a degree of repetition. Although the whole makes for thought-provoking reading, it is written in a language that speaks to academics and practitioners working in fairly high-level policy spheres rather than to readers looking for ideas that they can readily apply to their own practice.